That so many came to Hebden Bridge Local History Society’s meeting to hear Haworth historian Steven Wood talk about the Withins Farms is a testimony to the continuing fascination with the place so closely identified with Wuthering Heights. 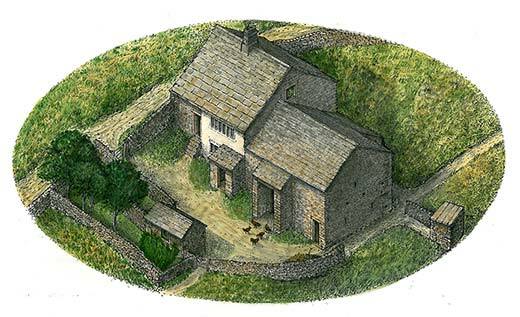 As Steven pointed out, that link was established when the publishers of Wuthering Heights were wanting to produce an illustrated version of the book.The sketch of the site that was included in the 1873 edition shows that it was the setting, not the building called Top Withins, that provided Emily Brontë with her inspiration. The three farms at Withins - Top, Middle and Lower Withins - occupy an island of cultivated land surrounded by heather moorland. There were farm buildings here from at least 1567, when 16 acres and buildings were purchased. The split into three farms seems to have happened in 1591, when William Bentley, wishing to divide his property equally between his three sons, set out in his will the exact conditons and rights by which they could farm and occupy the property. It would have been a hard living for a farmer at such a high altitude, but the combination of textile production and agriculture made it a profitable one. An inventory from 1696 for Lower Withins listing cows and sheep alongside looms and spinning wheels, illustrates this perfectly. The fields surrounding the farms would be meadows and pasture land, with cows being the most important livestock. There is still physical evidence of dairies in the barns, both in the form of a lintel inscribed with the word dairy, and of a dairy sink largely intact in one of the stone walls. Later inventories for Middle and Top Withins mark the change from wool to the more lucrative worsted weaving, while 19th century censuses record the decline of the home-based textile industry as work moved into factories. Twenty people were living on the three Withins farms in 1851; fifty years later, the buildings were abandoned. What is left of Top Withins probably owes its survival to the romantic connection which meant that no-one wanted to be responsible for its total ruin and some consolidation work was carried out from time to time. Its literary fame also ensured that it was frequently photographed, allowing historians to see the position of peat stores, dairy and barn. The site also had an appeal for artists, with L. S. Lowry, Joseph Pighills, Thomas McKenzie and Sylvia Plath among those who tried to capture its mood. Steven’s painstaking research into the histories of the three farms shows how a jigsaw of documents such as wills, inventories, censuses and reports can fit together with a study of maps and close inspections of the landscape and archaeology to create a vivid picture of life over time in these remote farmsteads. This detective work - linking documents, walking the landscape and inspecting the buildings is at the heart of the excitement of uncovering local history. This combination of inventory and field-work evidence has enabled Steven’s collaborator, Peter Brears, to recreate the living and working spaces in these three Withins farms in intricate drawings showing the contents in place. These can be found in the book by Steven and Peter: The Real Wuthering Heights; The story of the Withins Farms published in 2016. Next time we take a walk over that moorland, we will carry in our minds the history that Steven has uncovered, just as fascinating as the famous fiction. Hebden Bridge Local History Society meets fortnightly on Wednesdays at 7.30 at the Methodist Church, Market St. On Wednesday 22 November, David Taylor uses old photographs to recreate the weekend in 1897 when 20,000 descended on Hardcastle Crags. The final talk of the year on 13th December also looks at the Hardcastle Crags area, as Freda Kelsall recalls stories of Hawdon Hall, From Crime Scene to Holiday Camp. All welcome. Details of all the Society’s activities can be found on the website and you can also follow us on our Facebook page.